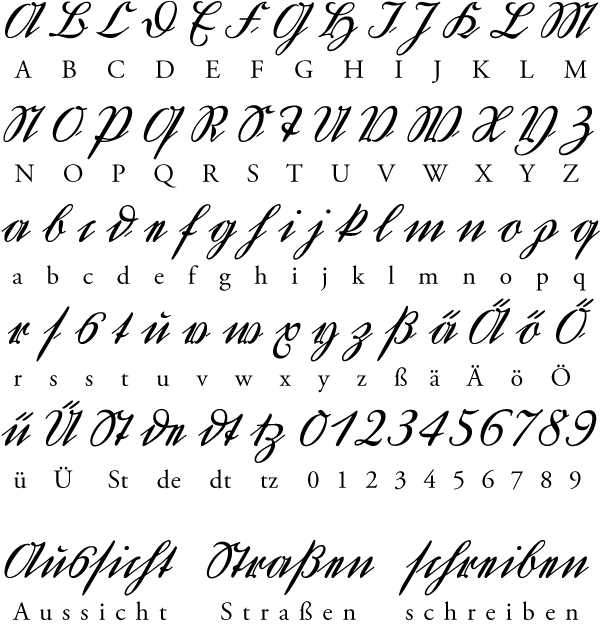 For most people outside of Germany, as well as younger Germans, the Kurrentschrift is nearly illegible – perhaps even more so than Fraktur printing. In contrast to the ‘round’ Latin letters, the Kurrentschrift is characterised by straight strokes, very sharp angles and egg-shaped curves, often tied by a small loop. These shapes did not evolve separately, but as part of the evolution which formed our type since the beginning. The long ‘s’ for instance was used already in Roman handwriting circa 300 AD. Originally scratched in wax, this informal cursive influenced formal book hand for the next 500 years to the extent that Ireland was the only remaining country to still use the round ‘s’. It was re-adopted at the end of words only after Christianisation. All letters of Kurrent similarly evolved from other precursors. The lower case letters a, b, f, g, i, l, m, n, o, q and t do not differ much from those of our Latin alphabet. The ‘c’ transitions into a ‘i’ without dot, because it appears in German only in ‘ch’, ‘ck’ and ‘sch’. The Gothic ‘h’ had a descender, which is still part of the Kurrent capital H, but tied in the lower case ‘h’. The ‘e’, which looks like a condensed ‘n’, gradually evolved from the latin ‘e’, which was originally written with 2 strokes (not with one like nowadays). Also it was not connected to the next letter at the bottom, but rather at the top. The Deutsche Kurrent avoids tracing back over a written stroke, instead it makes two straight lines (see r), or into upward curves in the case of capital letters (see R). The capitals are partly enlarged lower case letters: A, D, G, O, Q, S (from round ‘s’), T, U, V, W, Y and Z. The others adhere to the Latin forms. Only M, N, V and W can be traced back to uncial models, in which the V and W were also used for the lower case forms. D and ‘d’ seem to have uncial/Greek models. The ‘u’ is equipped with a hook above to make it distinguishable from ‘n’, a method that could lend greater clarity to many Latin hands too! German has all 26 letters used in the English alphabet, plus a few additional letters: umlauted vowels – ä, ö, and ü – and an Eszett, ß. It should also be noted that the lowercase letter ‘s’ has two different forms depending on its context. The long ‘s’ appears at the begining of a syllable, the round ‘s’ at the end of a syllable. There are certain rules for ‘sp’, ‘st’ and ‘sch’. The font Deutschkurrent chooses the right form of ‘s’ automatically by using a very sophisticated OpenType feature.